One of the key pieces to the anthropogenic climate/environment change puzzle is the magnitude of the earth’s climate sensitivity—generally defined as the global average temperature change resulting from a doubling of the atmospheric concentration of carbon dioxide (CO2). One of the reasons that the “climate change” issue is so contentious is that our understanding of climate sensitivity is still rather incomplete. But new research efforts are beginning to provide evidence suggesting that the current estimates of the climate sensitivity should be better constrained and adjusted downwards. Such results help bolster the case being made by “lukewarmers”—that climate change from anthropogenic fossil-fuel use will be moderate rather than extreme, and that an adaptive response may be more effective than attempts at mitigation. [The equilibrium climate sensitivity] is likely to be in the range 2°C to 4.5°C with a best estimate of about 3°C, and is very unlikely to be less than 1.5°C. Values substantially higher than 4.5°C cannot be excluded, but agreement of models with observations is not as good for those values. In IPCC parlance, “likely” means an expertly assessed likelihood of an outcome or result with greater than a 66% chance of occurrence. “Very unlikely” means less than a 10% change of occurrence. Visually, the IPCC’s assessment of the climate sensitivity based on its interpretation of the extant literature at the time of its assessment is shown in Figure 1. The IPCC routinely includes studies which conclude that there is a greater than a 10% possibility that the true climate sensitivity exceeds 6°C and some which find that there is a greater than 5% possibility that it exceeds 10°C. Fig 1. Climate sensitivity distributions retained (and in some cases recast) by the IPCC from their assessment of the literature. Note that the distributions fall off much more slowly towards the right, which indicates that the IPCC considers the possibilities of the climate sensitivity having a very large positive value (that is, a large degree of global temperature rise for a doubling of the atmospheric carbon dioxide concentration) to be not inconsequential (source: IPCC AR4). If the true value of the climate sensitivity does turn out to exceed 6°C, then we will be in for what will probably turn out to be fairly disruptive climate change. Heck, even if the climate sensitivity lies much above 4.5°C, coming climate change will be substantial. I for one, would hope that it lies below 3°C, and actually turns out to be closer to 2°C. A collection of research results have been published in the peer-reviewed scientific literature in recent months that buoys my hopes for a low-end climate sensitivity. Here are some salient quotes. The [climate sensitivity] mean is 2.0°C… which is lower than the IPCC estimate from the IPCC Fourth Assessment Report (IPCC, 2007), but this estimate increases if an extra forcing component is added, see the following text. The 95% credible interval (CI) ranges from 1.1°C to 4.3°C, whereas the 90% CI ranges from 1.2°C to 3.5°C. Current climate model projections are uncertain. This uncertainty is partly driven by the uncertainty in key model parameters such as climate sensitivity (CS)…The mode of [our] climate sensitivity estimate is 2.8°C, with the corresponding 95% credible interval ranging from 1.8 to 4.9°C. The above papers examined the “equilibrium climate sensitivity”—that is the global temperature change that results when all climate systems reach equilibrium with the changes in climate forcing that result from a doubling of the atmospheric carbon dioxide content. The time it take to reach equilibrium depends largely on the response of the oceans (and how quickly heat is distributed with in them) and is not known with much certainty. Estimates of the time to reach equilibrium run from decades to centuries. Thus, the equilibrium climate sensitivity may not be the best measure of how much temperature (and related) change may occur over the nearer term, like say, over the course of the remainder of the 21st century. A better estimate of that change is the “transient climate response”, or the amount of global temperature change that is manifest at the actual time that the atmospheric carbon dioxide is doubled (rather than waiting for the system to reach complete equilibrium). 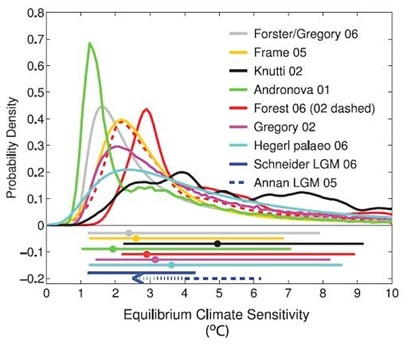 The transient climate response (TCR) is somewhat less than the equilibrium climate sensitivity. Two recent papers examined the transient climate sensitivity. Again, here are salient quotes. Our analysis also leads to a relatively low and tightly-constrained estimate of Transient Climate Response of 1.3–1.8°C, and relatively low projections of 21st-century warming… which is towards the lower end of the observationally constrained range assessed by [the IPCC AR4]. Now, by no means am I suggesting either that 1) the quotes above reflect all the intricacies of the respective papers, or 2) that these results are end all and be all on the topic. Neither, in fact, is true. But, the excerpts above do reflect the general conclusion of each paper, as well as what makes them noteworthy. In fact, the IPCC in its Fifth Assessment Report (which is now under construction) will be terribly remiss (and misleading) if they present a Figure that looks anything like Figure 1 (above) from their Fourth Assessment Report. In the intervening years, there has been substantial research into the probability distribution which contains the earth’s equilibrium climate sensitivity and the emerging bulk of evidence suggests that the IPCC’s “likely” range for the equilibrium climate sensitivity is much too large and that the possibility that the equilibrium climate sensitivity lies above 6°C is vanishingly small—if not entirely ruled out. Even the chance that it exceeds 4.5°C has been markedly reduced to being no more than about 5% (if not even less). And when it comes to the “best estimate” of the “most likely” value of both the equilibrium climate sensitivity as well as the transient climate response, it is refreshing and encouraging to see new results from different research groups pointing to a lower number than that forwarded by the IPCC in its AR4. It seems as we obtain more knowledge and understanding of reality, the specter of alarming climate change is driven further into the world of make believe. Olson, R., et al., 2012. A climate sensitivity estimate using Bayesian fusion of instrumental observations and an Earth System model. Journal of Geophysical Research, 117, D04101, doi:10.1029/2011JD016620. Padilla, L. E., G. K. Vallis, and C. W. Rowley, 2011. Probabilistic estimates of transient climate sensitivity subject to uncertainty in forcing and natural variability. Journal of Climate, 24, 5521-5537, doi:10.1175/2011JCL13989.1. Schmittner, A., et al., 2011. Climate sensitivity estimated from temperature reconstructions of the Last Glacial Maximum, Science, 344, 1385-1388, DOI: 10.1126/science.1203513.